What do you do when you find yourself living as a stranger? When Beth Lynch moved to Switzerland, she quickly realised that the sheer will to connect with people would not guarantee a happy relocation. Out of place and lonely, Beth knows that she needs to get her hands dirty if she is to put down roots. And so she sets about making herself at home in the way she knows best - by tending a garden, growing things. The search for a garden takes her across the country, through meadows and on mountain paths where familiar garden plants run wild, to the rugged hills of the Swiss Jura. In this remote and unfamiliar place of glow worms and dormice and singing toads she learns to garden in a new way, taking her cue from the natural world. As she plants her paradise with hellebores and aquilegias, cornflowers and Japanese anemones, these cherished species forge green and deepening connections: to her new soil, to her old life in England, and to her deceased parents, whose Sussex garden continues to flourish in her heart. 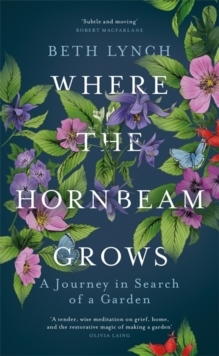 WHERE THE HORNBEAM GROWS is a memoir about carrying a garden inwardly through loss, dislocation and relocation, about finding a sense of wellbeing in a green place of your own, and about the limits of paradise in a peopled world. It is a powerful exploration by a dazzling new literary voice of how, in nurturing a corner of the natural world, we ourselves are nurtured.